At Corona Contracts we have had the pleasure of working with public and private schools, colleges and universities for over 20 years. These large buildings and institutions often have a huge range of specific requirements for their blinds and curtains. Many are historical structures, with windows that are extremely large and difficult to access, often with delicate features which must be preserved. Safety is also a key consideration for these clients, especially those institutions which cater for younger children. Our expertise means we are able to cater to these diverse and specific needs, providing bespoke blind and curtain solutions which look great, perform well and are built to last the lifetime of these busy spaces. We have carried out successful projects across Lancashire, Cumbria, Cheshire, Merseyside, Greater Manchester, Preston, Liverpool, the North West and throughout the UK. 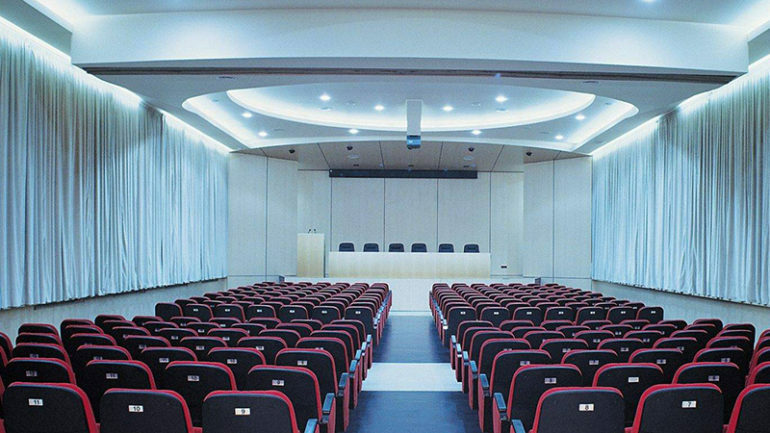 Our installations can be found in both traditional classrooms and other learning spaces such as laboratories, lecture halls, research facilities and auditoriums. Our blinds are curtains are always adapted for best performance in the space they’re installed in and can be further tweaked at the clients request. For example, drama classrooms and auditoriums often prefer curtains which reduce sound reflections, whilst some laboratories require blackout curtains. In each case, we carefully tailor and fit our products, from the design stage right through to installation, to meet the client’s needs. We have plenty of experience when it comes to fitting curtains and blinds in schools – particularly over school holidays – completing jobs that need to be finished within a strict time frame. If you run a school you know how important it is to hire reliable contractors to complete work that needs to be done, so you should look no further than Corona Contracts when it comes to blinds or motorised curtains. We boast a commercial blinds division which allows us to manufacture much of what we install ourselves, giving us complete control over delivery times and costs. By controlling each stage of the process we can guarantee customer satisfaction in our services. At Corona Contracts we offer practical solutions to the type of interior design issues you might find in a school. We also work with interior designers and architects, so if you’re planning a new building on an existing site we can get involved in the process at the earliest opportunity to find the light and curtain solution that will perform best in the new space. We install all types of commercial and medical blinds, printed blinds, curtains, curtain track systems, technical window films, privacy window films and customised manifestations (frosted graphics) in various buildings and institutions around the country. We also pride ourselves on not compromising on aesthetics. All of our products are customisable based on your requirements so that they fit perfectly into the environment in which they are installed. Our skills can go a long way to creating a pleasant and productive learning environment for children and teachers. At Corona Contracts we aim to maintain an unrivalled service in everything we do. If you want to find out more about what we have to offer, please get in touch on 01772 616426 today! Are discounts available for educational institutions? We treat all our customers as top-level VIPs and as such cannot offer preferential discounts, but depending on the scale of the project we are open to negotiations, so please get in touch today.